Not sure if you've been living under a rock but, in case you have, we have some earth-shattering news for you – the Spring Racing Carnival has well and truly started! Amid the fashion and the fillies galore, you might be wondering what the heck is going on. Don't worry, this is where The Urban List comes in – welcome to the Spring Racing Series! First up, the AAMI Victoria Derby…. The first Victoria Derby was run back in 1855, making it Australia's oldest race, not to mention one of the crowd's favourites! Now a Group 1 race for three-year-old thoroughbreds, the Victoria Derby is run over 2500m with a $1.5 million prize awarded to the first past the post. We won't lie – as great as the actual horses are, we get really excited about the fashion! There's no other event like it, when you can put together a complete outfit (remember it's not just about one element, it's the whole package) and top it off with a cable-dish sized headpiece. Traditionally, ladies wear monochromatic black and white outfits, which we strongly encourage – after all, there are plenty more opportunities to wear colour. The outfit of choice for the gents is the classic morning suit topped off with the Derby's flower of the day, a blue cornflower, on the lapel. Need some help putting together your outfit? 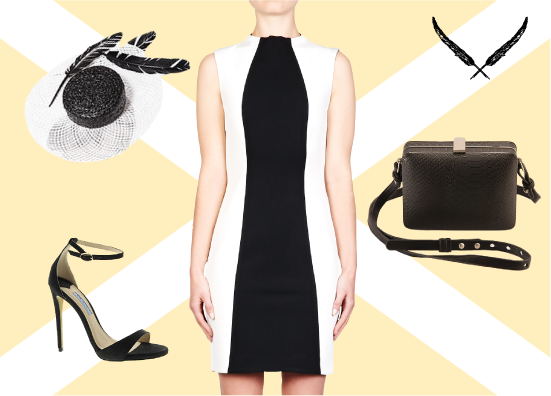 These are some of our favourite black and white looks. Dress: Nicholas from Green With Envy, Hat: Lady of Leisure Millinery, Clutch: Tony Bianco and Heels: Tony Bianco. Dress: Ginger & Smart from Green With Envy, Fascinator: Kerrie Stanley, Heels: Saint Laurent from Miss Louise and Clutch: Pierre Hardy from Green With Envy. Dress: Zimmermann, Hat: Mimco, Heels: Nicholas from Green With Envy and Clutch: Zimmermann. Dress: Viktoria + Woods, Hat: Morgan & Taylor, Heels: Tony Bianco and Clutch: Pierre Hardy from Green With Envy. While you're at it, take a peek into our Spring Racing little black book for all the best places to eat, shop, drink and be pampered at come racing time!